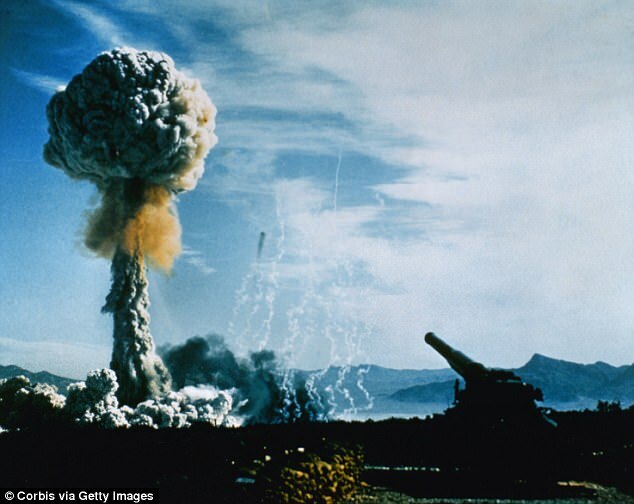 Beginning in the 1950s, the US government conducted hundreds of atomic weapons tests at a remote site in Nevada, in efforts to ramp up nuclear capabilities amid building Cold War tensions. But, nuclear fallout from reckless experiments prior to 1963 had grave and unintended consequences – and, new research reveals they may have been far more extreme than ever suspected. Above-ground tests on US soil left millions of Americans exposed to ‘tremendous’ amounts of radioactive pollution, which made its way into the environment and the food supply, leading to as many as 695,000 deaths from 1951-1973. After 1963, tests in the US were moved underground – but by then, there had already been 100 atmospheric tests at the Nevada Test Site. In a new study, University of Arizona researcher Keith Meyers analyzed annual county level fallout patterns across the US. And, there was one vector in particular through which Americans came in contact with the deadly pollution – milk. ‘During the 1950’s most milk was consumed in the local area it was produced,’ Meyers explains. 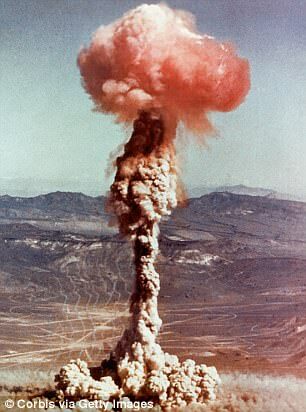 Millions of Americans were exposed to radiation from both the environment and food supply as a result of above-ground tests at the Nevada Test Site. According to the study, humans are able to metabolize specific radioactive isotopes crated through fission. The main exposure in this case comes from irradiated food products. Cows consumed massive amounts of irradiated pasture, as winds carried the pollution far from the test sites. And, radioactive material was thus concentrated in their milk. 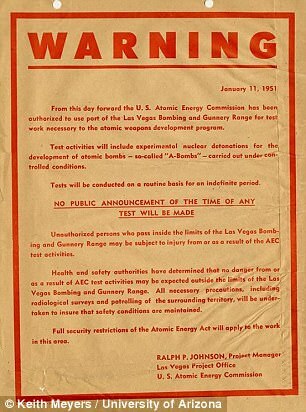 Prior to 1963, many above-ground tests were conducted on US soil, at the Nevada Test Site. 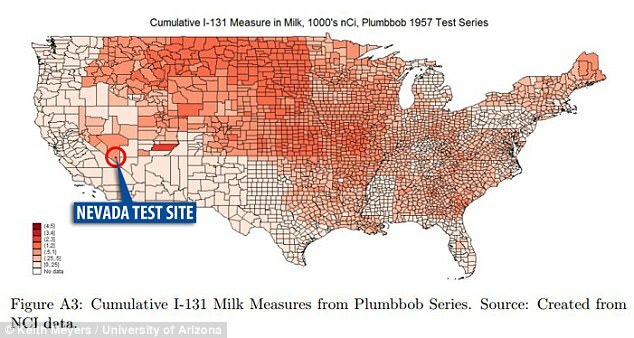 The researcher examined estimates of the pollution concentrations in the locally produced milk, revealing grave figures on human exposure to the fallout. rom 1951 to 1973, Meyers found that the radioactive isotopes from the tests contributed to as many as 395,000-695,000 deaths. The effects weren’t just isolated to the regions right around the test site. The researcher found that the pollution made its way across the whole country, with higher concentrations in a number of hotspots. ‘The geographic scope of the mortality consequences of NTS activities is broader than what previous research has shown,’ Meyers writes. Between 1951 and 1963, 100 of the above-ground tests were conducted at the Nevada Test Site. 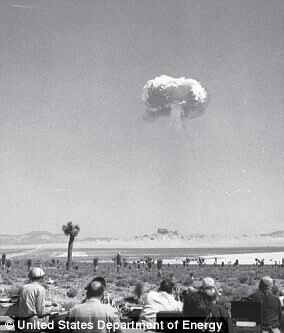 Atmospheric atomic bomb tests in Nevada during the 1950s created mushroom clouds that could be seen for nearly 100 miles. 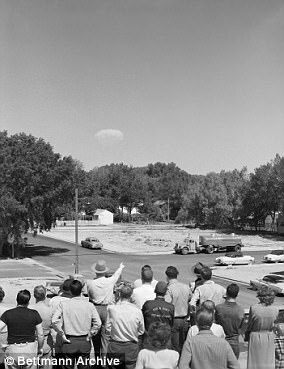 The nuclear tests soon became a major tourist attraction, with reporters, locals, and out of town visitors traveling to watch the action. ‘After the first test, people from Los Angeles began arriving in anticipation of witnessing either a detonation or some of the imagined destruction wreaked by the blast,’ according to a report from the Department of Energy. People in the area set their alarms to wake up in time for 5:45 a.m. detonations, and cars would line up to catch the best view. The United States conducted over 1,000 nuclear tests from 1945-1992. 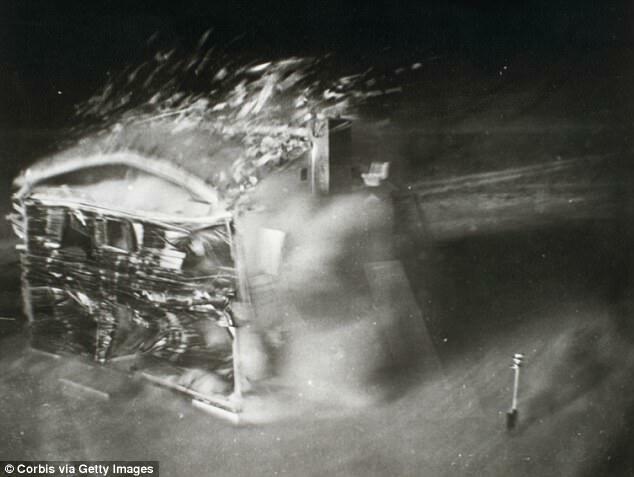 In total, there were 219 atmospheric tests - meaning they are carried out in the atmosphere, being dropped from airplanes, detonated on barges or islands, or being buried at a shallow depth to create a surface-breaking crater. 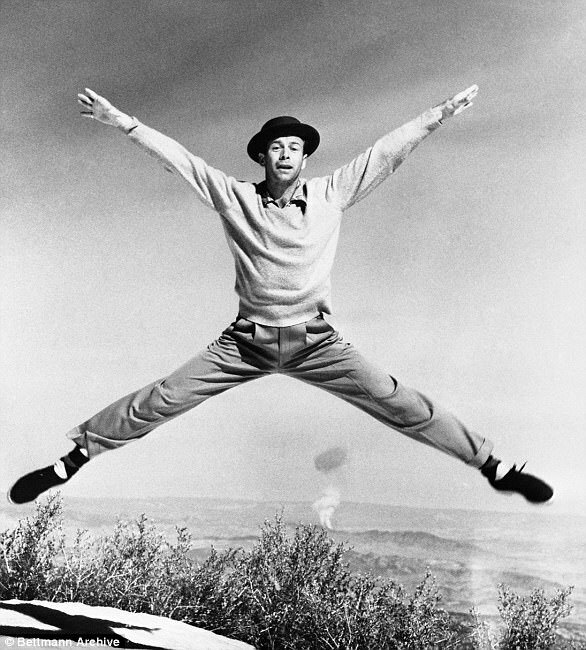 Dancer Gene Nelson poses for the 'Atom Antic' on a mountain top not far from Las Vegas. 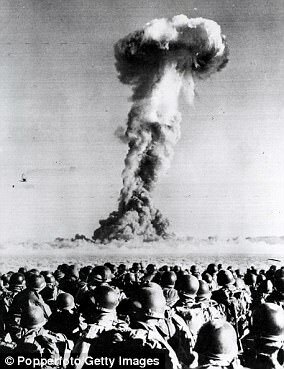 An atomic mushroom can be seen rising in the background. Some of these took place in what’s known as the Pacific Nuclear Proving Ground, which includes a number of sites in the Marshall Islands. 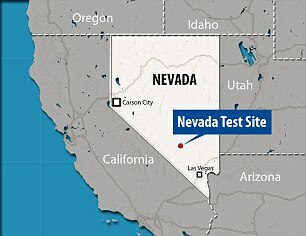 The rest primarily took place at the Nevada site. Research suggests these tests likely contributed to hundreds of thousands of deaths across the country, as fallout entered the environment and atmosphere. 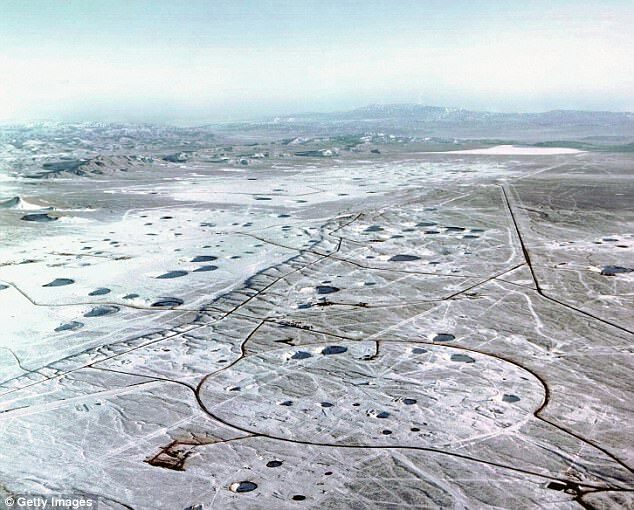 After 1962, all nuclear tests in the US were conducted underground. ‘The largest health effects appear in areas far beyond the scope of previous scientific and medical studies. ‘The scientific and medical literature has studied the effects of atmospheric testing on populations residing in Downwind counties in Arizona, Nevada, and Utah. 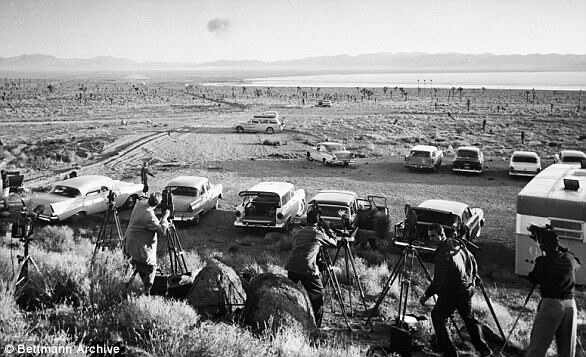 Prior to 1963, many above-ground tests were conducted on US soil, at the Nevada Test Site. 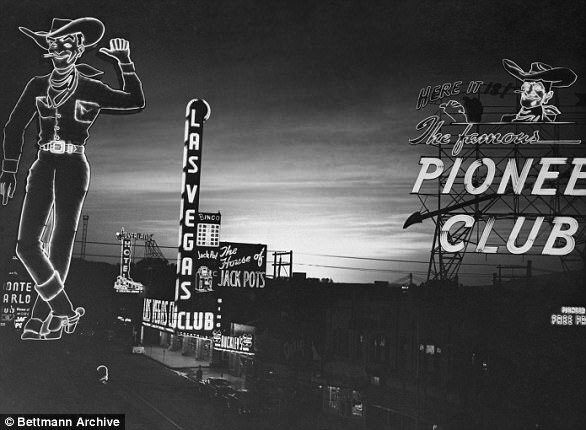 Atmospheric atomic bomb tests in Nevada during the 1950s created mushroom clouds that could be seen for nearly 100 miles. This was largely due to pasturing practices at the time, the researcher notes. And, had it not been for the testing moratorium put in place in 1958, and the Partial Nuclear Test Ban Treaty, there likely would have been hundreds of thousands more.